Need a new chicken recipe? 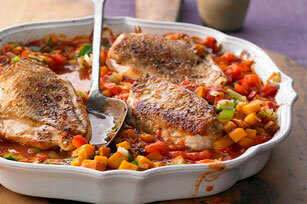 Then, check out our recipe for Chicken with Fall Ratatouille. This delicious recipe features lots of great fall vegetables. Heat oil in large skillet on medium heat. Add chicken; cook 4 min. on each side or until done. Transfer to plate; cover to keep warm. Heat dressing in same skillet. Add onions, carrots and garlic; cook and stir 5 min. or until crisp-tender. Add zucchini and peppers, cook and stir 5 min. Stir in tomatoes; bring to boil. Simmer on medium-low heat 5 min., stirring occasionally. Serve chicken with vegetable mixture. Stir 2 Tbsp. Kraft 100% Parmesan Aged Grated Cheese into vegetable mixture before serving. Serve with hot steamed rice or spaghetti.